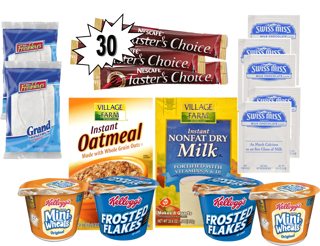 Includes, 30 single Taster's Choice coffee packs, 5 Swiss Miss Hot Cocoa packets, 2 Jumbo Honey Buns, 2 Frosted Mini Wheat, 2 Frosted Flakes, 1 Variety Box of Oatmeal, and 1 box of Powdered Milk. **We only offer Taster's Choice coffee packs in this Care Package. Weekender Participants may not purchase this care package.